Inspired by the Chroma Conference I have put together this special collection of nine essences. These essences are made of the exact plants that Dr Edward Bach first published in 1933. 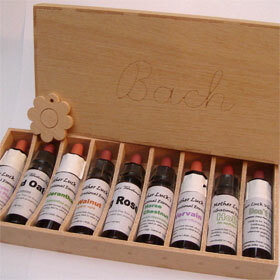 I do not adhere to the Bach method of making essences. Dog Rose (Wild Rose), Horse Chestnut (White Chestnut), Scleranthus, Vervain, Holly, Wild Oat, Walnut, Himalayan Popping Plant (Impatiens). Where I have used my childhood names for the plant I have put the Bach names in brackets. Don't Panic is made to the same recipe that Dr Bach specified as his recipe for Rescue Remedy (Walnut, Star of Bethlehem, Cherry Plum, Rock Rose, Clematis, Impatiens). All of these have been made by the sunshine method.